I get asked this a lot, and just like everyone else I had to learn it to pass it on to my friends, family and now you if you are reading this. I am going to show you the exact way I learned from the same man who showed me how to do it, Grover Brown. First you dig a limit of clams. Toss in into a 5 gallon bucket of fresh water, and let soak for a few hours. 1. 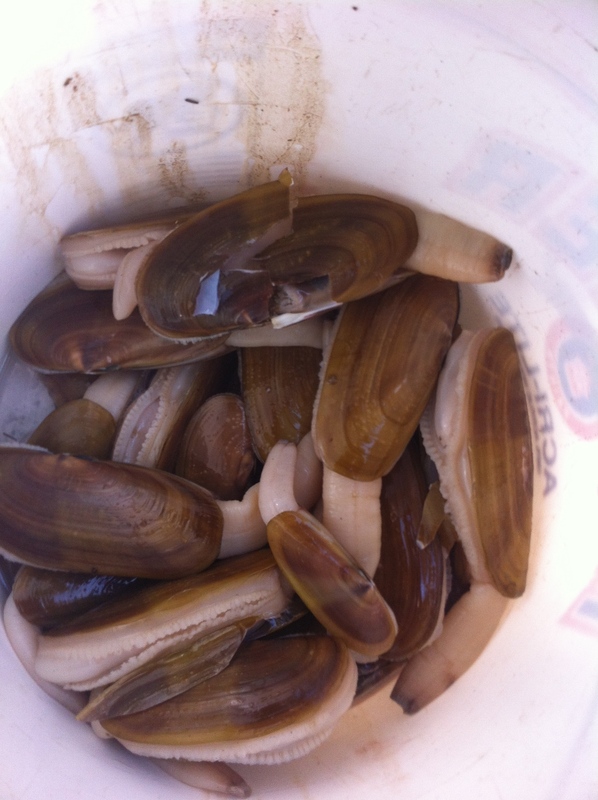 Put clams into a 5 gallon bucket and let soak for a few hours so they pump the sand out of the system. 2. 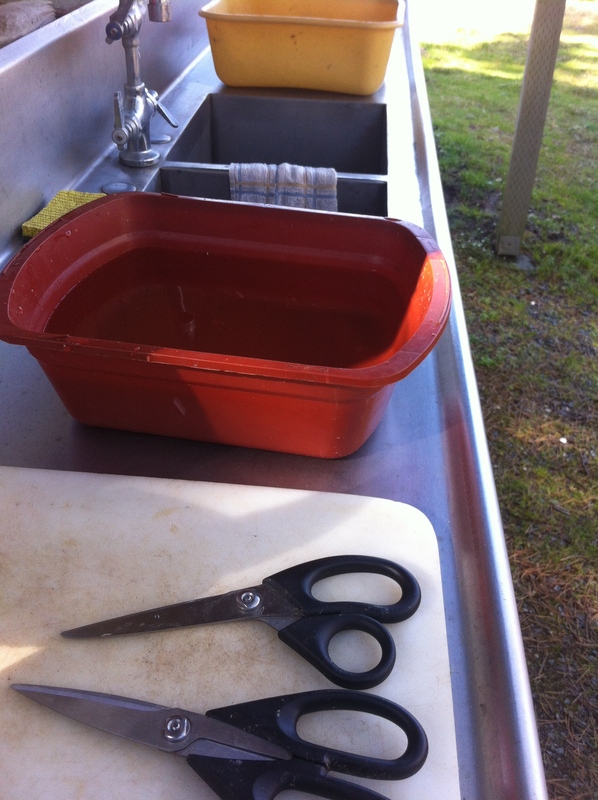 Prepare your working station with tubs and scissors or filet knives. Get your cutting boards, scissors, and tubs of clean water ready. 3. Get your hot water ready to poach the clams. Bring to the point of almost boiling then back off the heat. 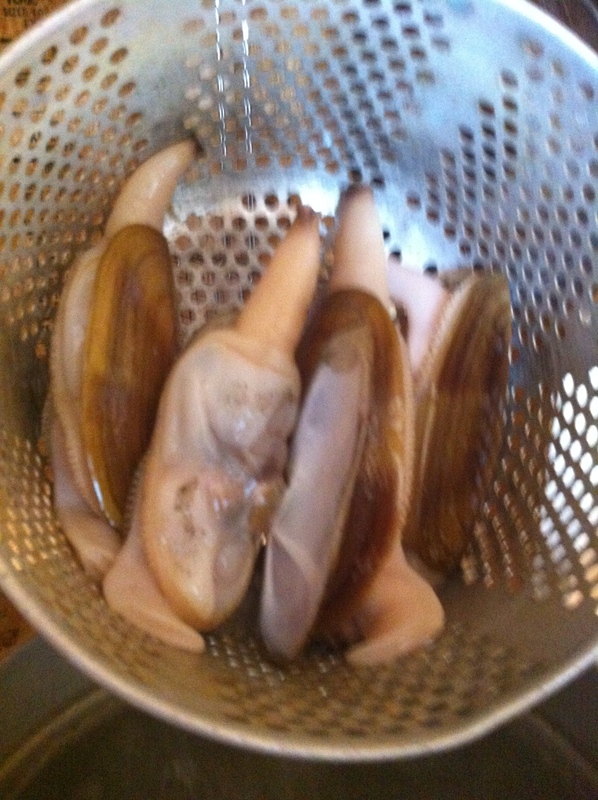 Take your clams and put them into a strainer, HAVE A BUCKET OF COLD WATER STANDING BY, you don’t want to overcook them. 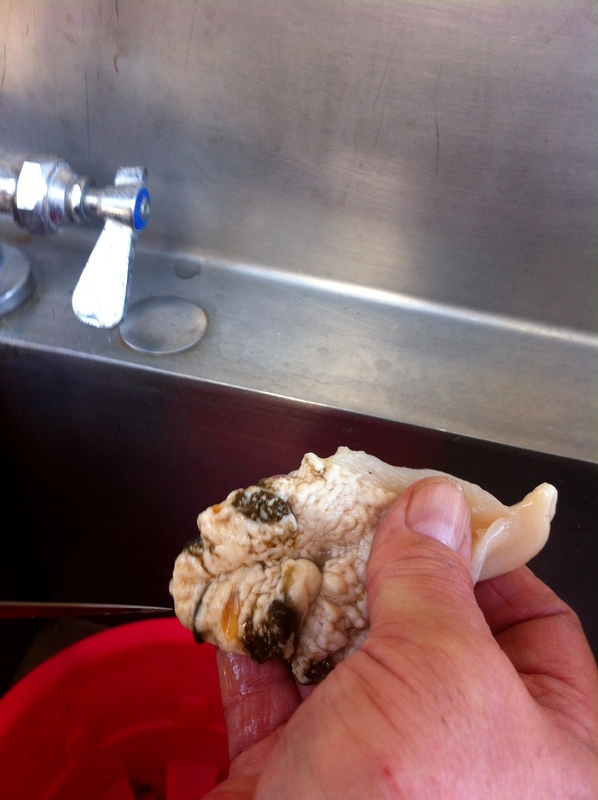 Dip your strainer into the water with your clams, the shells will open in seconds, then toss them into the cold water. 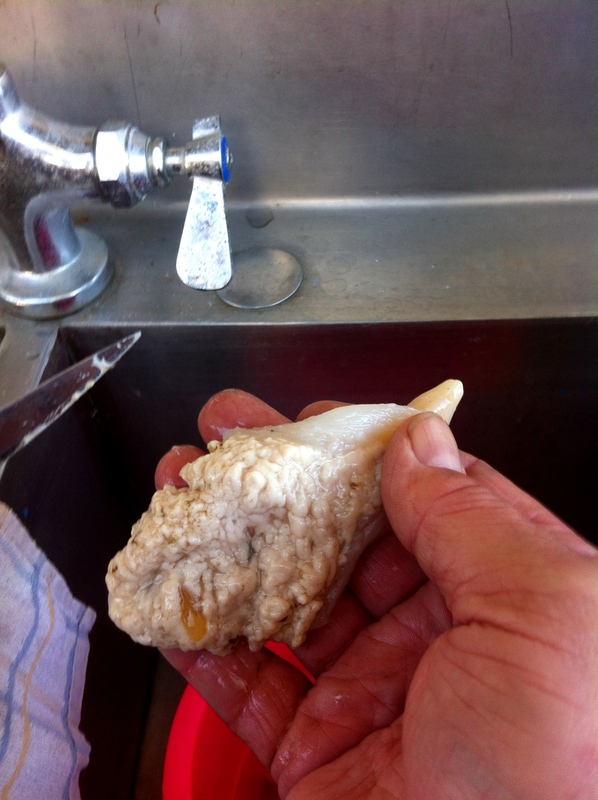 Once the shells open, toss the clams and the shells into the cold water bucket. Once you have completed all the clams, and they are now all in the bucket. Separate the shells and the clams and bring them over to your working station. 1. Cut off the tip of the neck. Cut the top of the neck. 2. 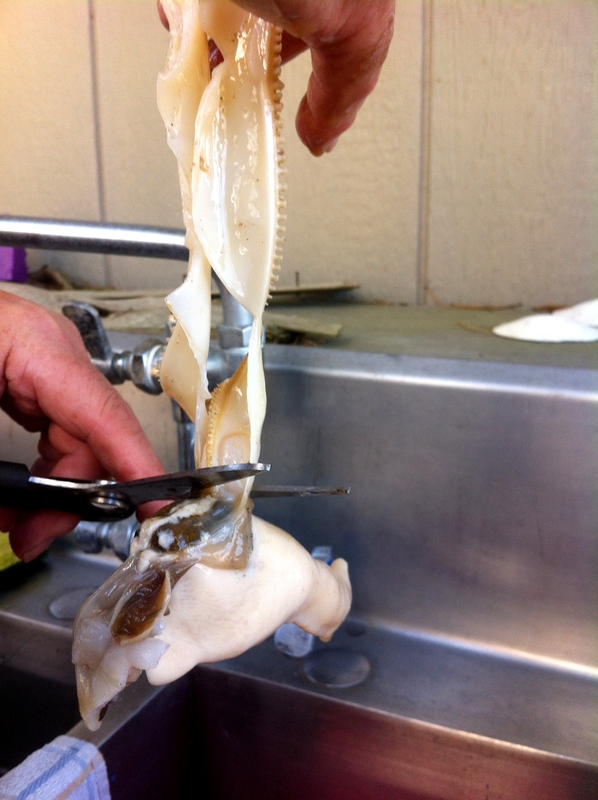 Turn the clam to the side and make and cut up the side and thru the neck. 3. Keep making the incision all the way thru to the top of the neck, remember this is an incision, do not cut the clam in half. We are just opening up the clam. Finish the cut all the way to the top of the neck. 4. 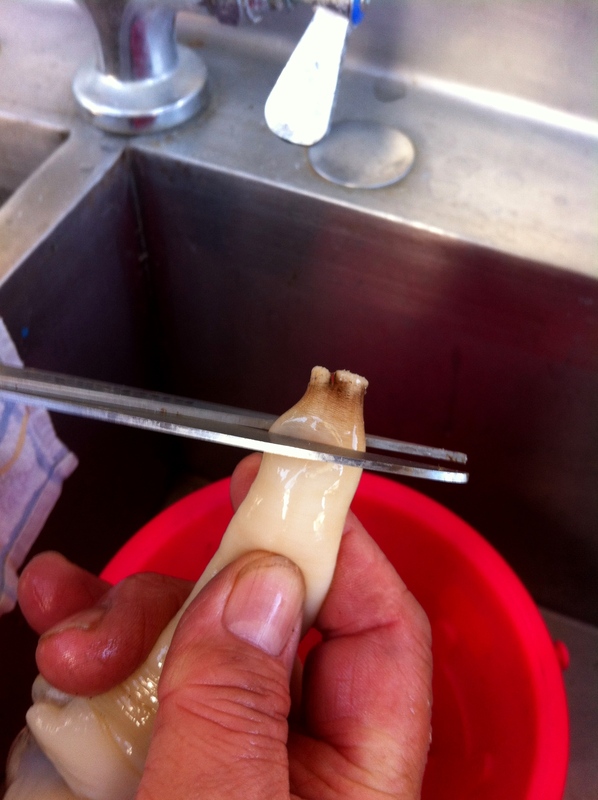 Once the clam neck is open you will see a small ventricle tube that runs up the neck. Make a cut that opens that ventricle all the way to the top of the neck. Then make an incision inside the neck on the ventricles to open it up. Finish the incision up to the top of the neck. 5. 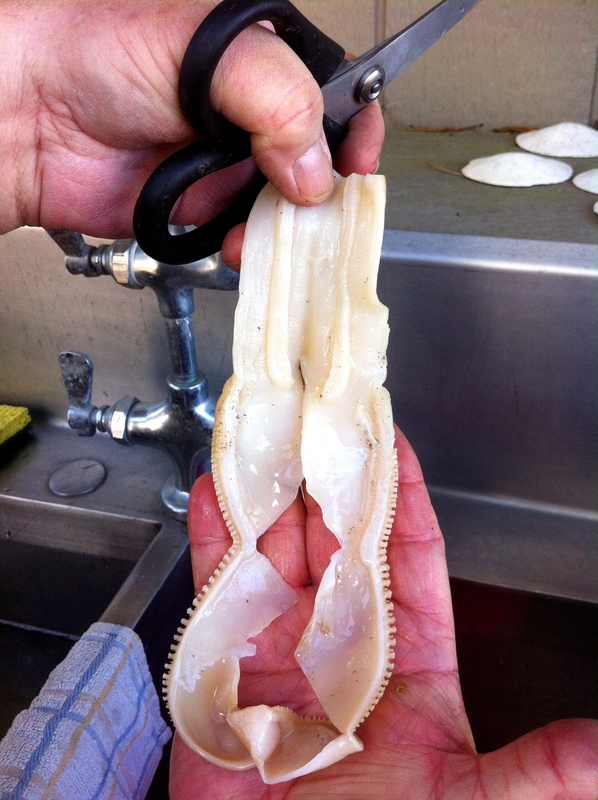 Holding the clam in the same position make two cuts on each side of the gills (they look like guts). This should be like an upside down V cut. Make two cuts like an upside down V on both sides of the gills and palls (mouth parts). 6. As you make the cuts the gills will fall down, and you will cut them off the foot. Then make the cut separating the foot. 7. Then you cut the foot loose from the body. Then make sure the body of the clam is clean of sand. 8. Toss the body into the tub of water you have in your work station for final cleaning. 9. Pick up digger foot and cut any remaining debris from it. Cut off the top of the foot diagonally and squeeze a little to push any debris out of the foot. 10. When you squeeze the end of the fresh-cut, removing the stomach. A clear rod, called the crystalline style will come out as well. 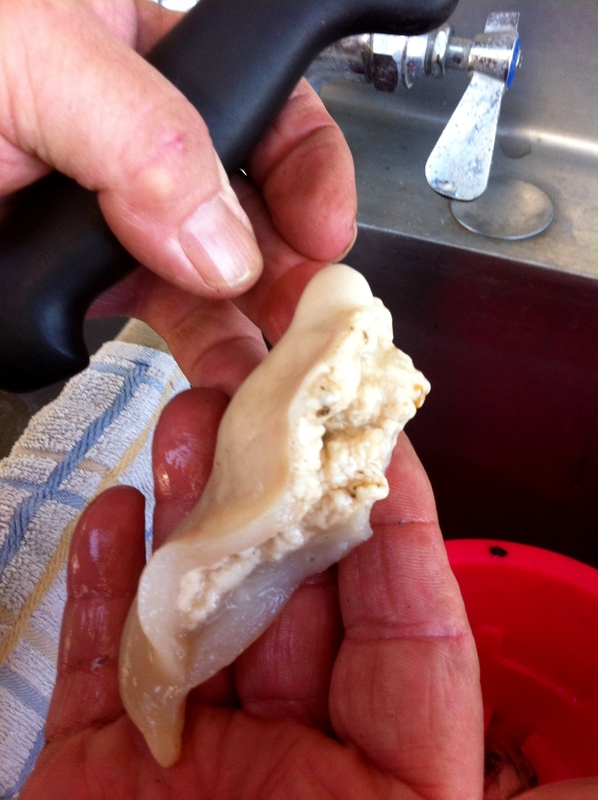 The clam uses the style as a digestive enzyme to break down the food they eat. Then make another cut to open up the foot to clean. 11. Make another incision up the foot to open it up for cleaning. Once open begin to clean under running water if you have it. 12. Make sure to lightly clean all the sand debris out of the foot, but leave the meat in tact. The butter substance in the foot is full of flavor. 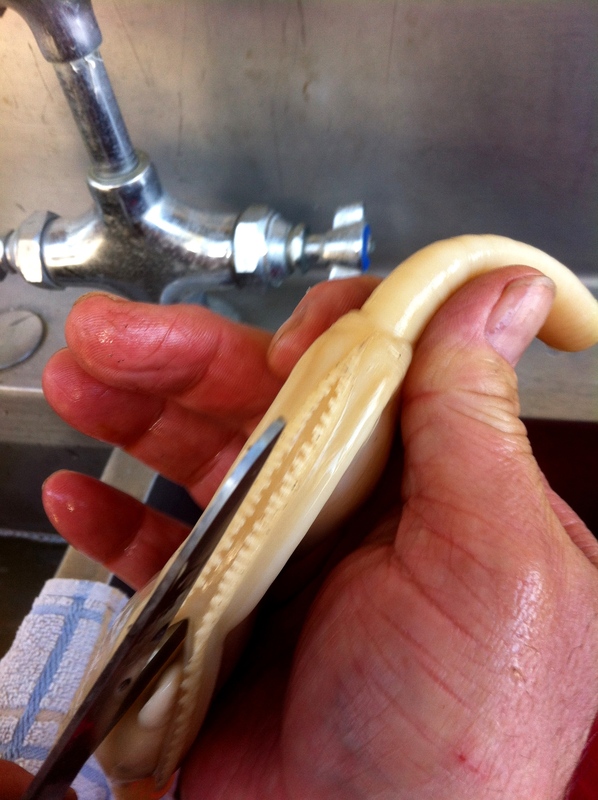 The foot itself is the delicacy of the entire razor and full of flavor with a very soft texture. This is almost clean enough to be tossed into bucket of water for final cleaning. This is clean and ready for the fresh water bucket. 13. The final stage is to go thru each clam to make sure there is no sand and very clean. This is really important if you do not want to bite into sand over dinner. 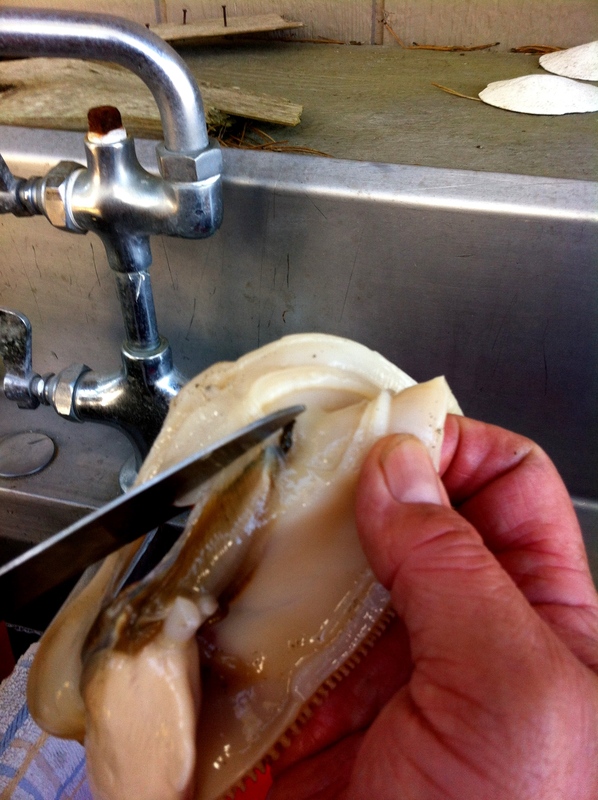 I absolutely hate that, so we make sure that the clams are inspected very well. 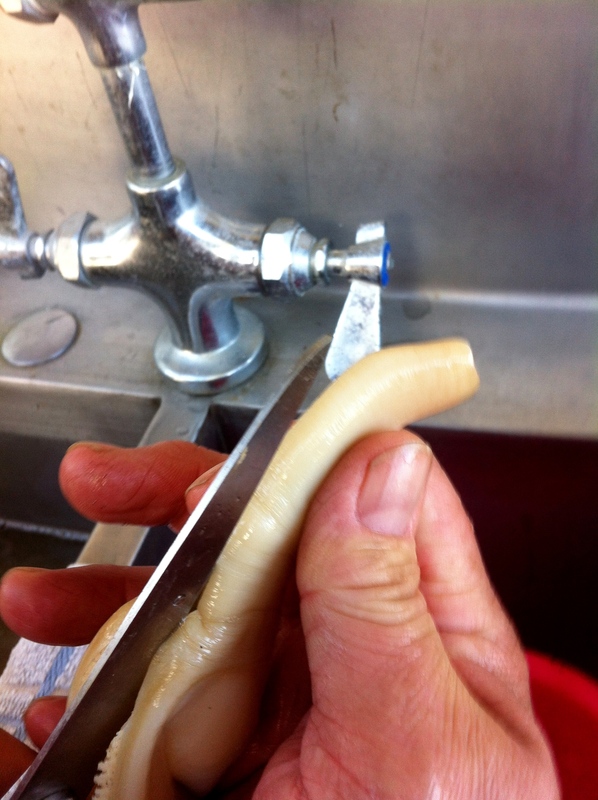 This is what your clean razor clams should look like! 14. I usually take them home to vac pack them, make sure when you do package them to the freezer that you bag them in pairs. 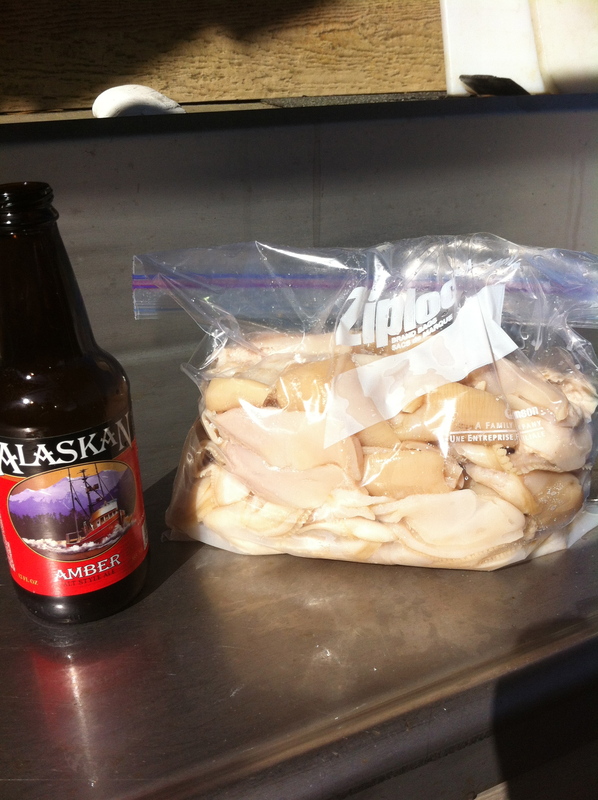 For example, 10 clam bodies and 10 clam foots. 15. Grab a cold one to celebrate your hard work for the day. I hope you all get the chance to go out on the beach to explore the outdoors and have the opportunity to spend a great day with the family. These are times you will enjoy and not forget and your children will pass it on from generation to generation.